There may be a day you need to teach your children at home. It could be for prolonged snow days or for a long period of power loss, or simply because their school doesn’t cover an important (to you) topic. Having books on hand about history, math, biology, literature, and science gives you the ability to teach your child. If you can find a complete encyclopedia set, you have found a highly sought after item. These kinds of books can also be helpful for research when a report is due, but the Internet connection is down. First aid, gardening, woodworking, sewing, cooking – these topics and instructions can easily be found online. If the power is out and you need information on one of these topics, you should have books about these on hand. As with math, some subjects don’t really change and antique books can be the best reference for some of them. Books also give you something to do in case the normal life pleasures aren’t available. Reading out loud to kids can be calming in emergency situations. Stocking up on classic literature is one way to ensure your family is not bored, even with a prolonged power outage. Consider tucking a family favorite in a bug out bag, too. And about those classics, such as Peter Pan, Oliver Twist, and Robin Hood, somehow along the way of our public system evolving, it was deemed that these were too difficult for American kids to understand. Not so! Homeschooled kids read these books all the time, along with countless other classics and do just fine. Remember that while Kindles are great, they do need to be charged, unlike physical copies of books. Book margins have been used in history as a place for people to journal and write their thoughts. During the Holocaust, one person used the margins for a personal diary. When paper is scarce, books can give you a place to write things down. What books would you want to have around just to pass on to future generations? If a day ever came where you could not travel far to a library, your library would consist of the books in your home and the homes around you. Books do take up a lot of space, but they can be tucked away in unused storage locations, like under the bed or in closets. But, one nice thing about books is that they can be used as decorations on top of furniture or even as furniture. Have you seen the coffee table made out of books on Pinterest? If you have a large number of books, be careful if you put several full bookcases in a row that they need to be on a load-bearing wall. They really can get quite heavy, but this is usually only a problem if you have several bookcases together. 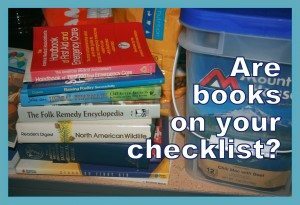 If you need ideas of where to find books inexpensively, read some tips here in another Survival Mom article. I tend to find mine in used bookstores, library book sales, thrift stores, and garage sales. Why do you think books should be a part of prepping? 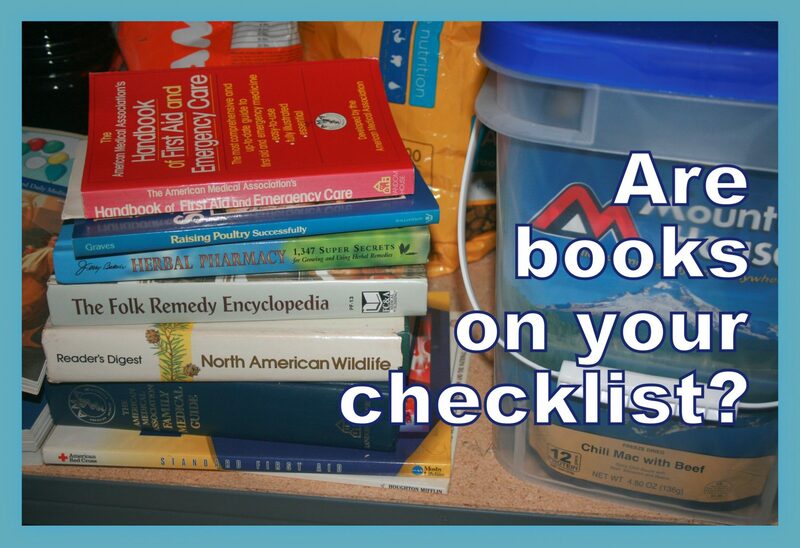 What kinds of books are best to have on hand? I’m a book junkie too, and truly believe you can never have too many! I hit a lot of book sales which you can find on booksalefinder.com. You can sign up for a weekly email that tells you what sales are in your area. The only problem is some book sales are more organized than others so sometimes you have to do some digging! We have always been bibliophiles. Our personal library was bigger than our branch public library at one point. But with needing to find room for other important things (like food, medicines, and water) we have started to downsize our library. BUT we bought a basic Kindle this last Christmas, for the whole family, and we are slowly replacing some of the fiction with Kindle versions. A basic Kindle holds 1000 books, and the battery can last as long as a month if you can restrain yourself to reading 1/2 hour a day. We also bought a solar battery charger that will work with the Kindle. The reference books are still being kept in physical form, although I’m thinking of putting at least a few of them into the Kindle in case we have to Bug Out.